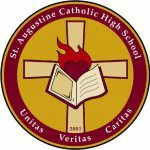 Students who enroll at St. Augustine Catholic High School do so with a complete awareness of the uniform requirements. Therefore, by choosing St. Augustine Catholic High School, he/she implicitly agrees to abide by the uniform policy. We regard the uniform as a means of creating a distinct school identity. Students who do not respect the code, are in effect, undermining that goal. Navy blue flat front pants, from DGN Kilters, with the embroidered school logo on the side; no altering/tapering permitted with the exception of length. No other pants can be worn. White or maroon polo/golf shirt (long or short sleeve) with the embroidered school logo from DGN Kilters*. If wearing the maroon school sweater with embroidered logo and ¼ zipper from DGN Kilters, you must wear it over a St. Augustine C.H.S. polo/golf shirt. No other sweaters can be worn. All black shoes including top, sides, soles and laces. They may be dress or athletic shoes. No boots, sandals, open back or open toed shoes. No white coloured logos or laces. Only the above-mentioned school apparel is permitted. Team, Club, HPE, or Committee apparel is not permitted during regular school hours. *Only white t-shirts may be worn under the uniform golf shirts.